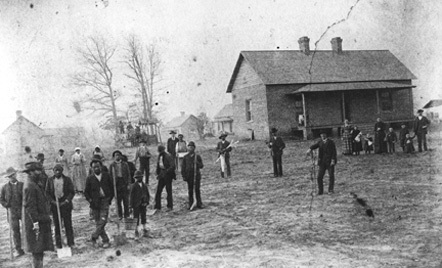 Pictured here are the grounds of the county home and prison farm, showing the main house and surrounding buildings and some of the inhabitants, overseen by armed guards. Members of superintendent Henry Daniel Leigh’s family stand at the far right. In 1881 Durham County purchased a tract of land on Roxboro Road to build a county home—a poorhouse—for “the care of the aged, indigent and infirm” on the site where Durham County Regional Hospital now stands. The next year a prison and workhouse were constructed on the same site “for the confinement of criminals undergoing sentences of not over ten years.” Prisoners and able-bodied poorhouse residents maintained the facility and tended the farm. Within the last few years the lands have been brought into a high state of cultivation, whilst neat and well ventilated cottages (some of brick), have taken the place of the poor cabins that formerly served as shelter for the unfortunates whose only crime was being poor and mentally or physically infirm. The poor inmates are now well-housed, clothed and fed, and are surrounded by Christian influences and accorded humane consideration in striking contrast with the neglect, squalor and savagery that prevails at some similar institutions in some counties of the State. Despite the glowing description, in 1890 the county inspected the facility in response to accusations that John W. Evans, superintendent of the poorhouse and workhouse, was mistreating the residents, misappropriating funds, and generally mismanaging the facility. According to witnesses, Evans had elevated the rank of certain prisoners to that of trustee. These “trustees” were given the run of the grounds, and in one case a prisoner was allowed to spend nights and Sundays at his home. Furthermore, reports surfaced of injured or ailing poorhouse residents being left to die unattended. Although it was determined that “the management of the Poor House is by no means what it should be, being in many respects worse than can be imagined,” the county commissioners ultimately ruled that Evans had not committed “any criminal act or neglect,” and he retained his position. By the turn of the 20th century, the practice of housing the impoverished and convicted together had come under scrutiny. By 1925 a new jail had been built less than a mile away and a new home serving primarily the impoverished and disabled was constructed, separating the two populations. County homes began to fall out of favor altogether by the 1930s, replaced by government-funded social security and welfare programs. Durham’s persisted until the 1960s.